Rouge at last year's Back To The City. Photo by Sabelo Mkhabela. This year's Back To The City festival lineup is out. The biggest South African annual hip-hop and street culture festival, Back To The City is taking place in Newtown, Joburg on the 27th of April, the country's Freedom Day. The organizers just released this year's lineup, and as usual, it's diverse, combining both up-and-coming and established artists, and both old and new school. The likes of Cassper Nyovest, Stogie T, YoungstaCPT, A-Reece, Ginger Trill, Otarel and a lot more will be taking to the stage come the 27th. Legendary kwaito group Boom Shaka will also be performing on the day, as part of the Heritage feature the festival organizers introduced two years ago to celebrate pioneers. Back To The City has been going since 2007, when it attracted 3500 attendants. In 2017, there were 25000 hip-hop heads in attendance. The festival has become the mecca of South African hip-hop lovers, as it celebrates all elements of the artform—MCing, DJing, breakdancing and graffiti. 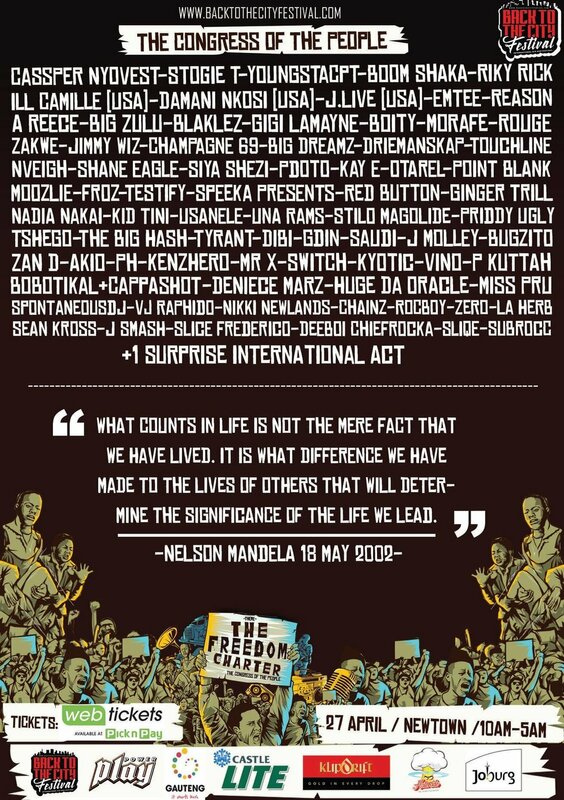 The festival now also hosts golden era US rappers alongside the country's finest. In the past few years, the likes of Jeru The Damaja, Pharoahe Monch, Elzhi, EMC and a few more have performed on the festival's main stage. View the full lineup below, and buy tickets here.